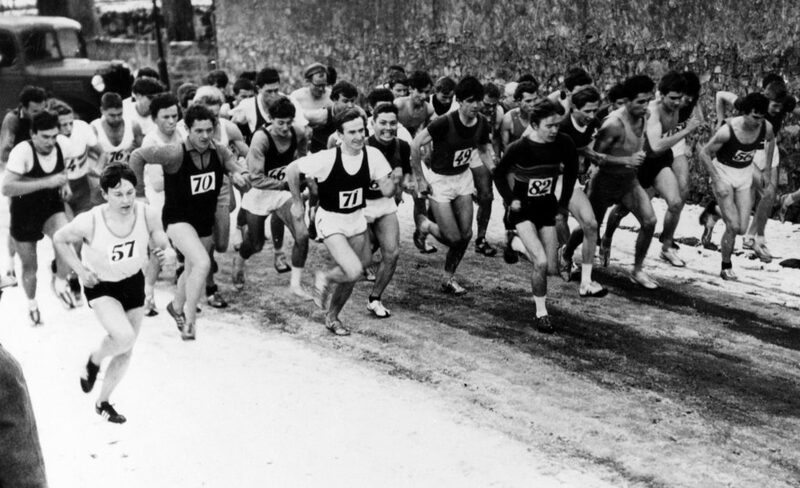 Scottish running, like Scottish society in general, has given a lot to the world in the form of emigrants. One of the best of these was John G McCall – universally known as Buster – whose life after his departure from Scotland has been remarkable. 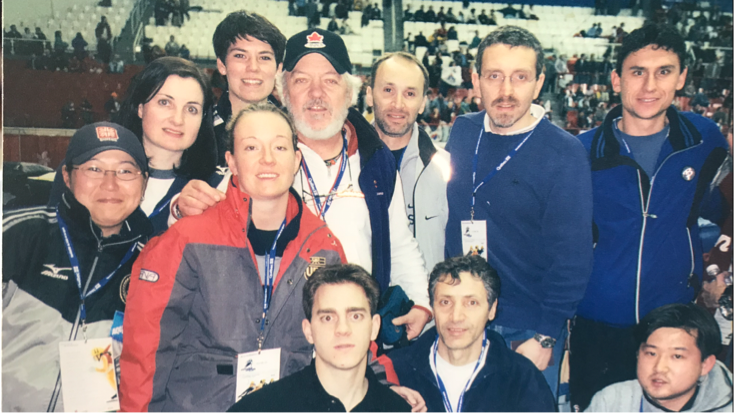 John G McCall is an excellent example of the successful Scot abroad: a doctor who graduated from Glasgow University, he went to Canada where he set up a very successful practice and after getting involved in winter sports, was a doctor on four Canadian Winter Olympics teams. He has also had a wonderful time climbing and adventuring all round the world. 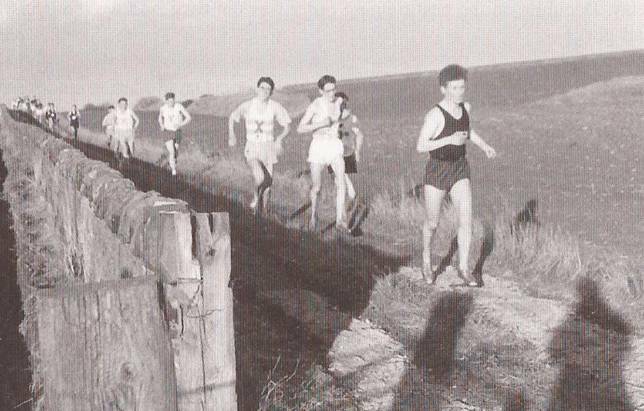 He had started out with Clydesdale Harriers before he went to University and had won the club’s Youth and Junior cross-country championships as well as running in all the championships – Dunbartonshire, District and National. So he had some background in the sport before going to Gilmorehill. As a student at Glasgow he again ran in all that mattered athletically, he ran on all surfaces – road, track and country – as well as in all the confined university and inter-university events. 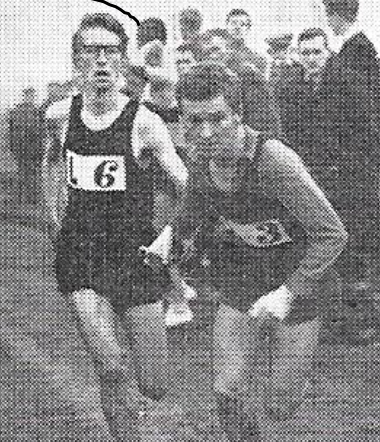 His last run in the National Cross-Country Championships for Clydesdale was in season 1959/60 when he was second scoring runner in the Youths team along with Charlie Stimpson and Duncan Stewart. The following year as a first year junior he was in the same Glasgow University team as such luminaries as Douglas Gifford, Jim Bogan and Ray Baillie and running for the university. 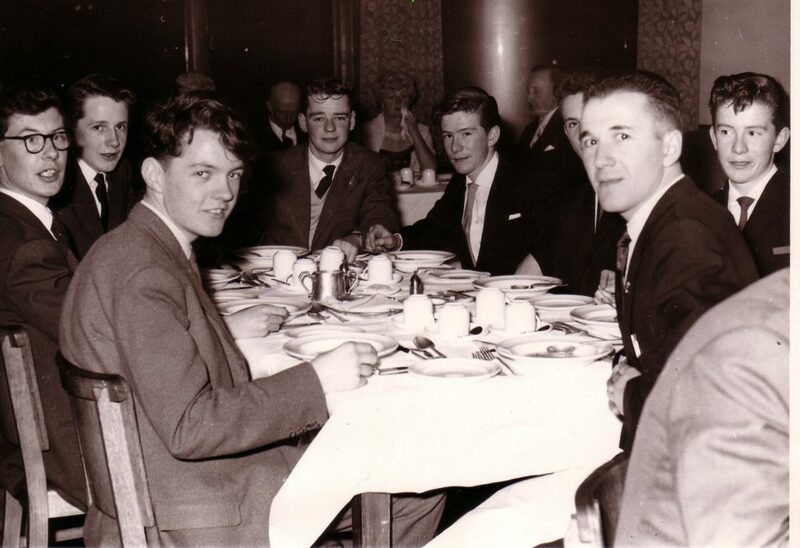 The following year the team was strengthened by the addition of Allan Faulds and was very strong indeed: they won the junior national in 1961/62. His first race in the Edinburgh to Glasgow was in 1965 when he ran on the exposed five and a half miles of the fifth stage. John has been good enough to reply to our request for information with this account of his career. At the age of almost 76, I am attempting to give an account of my involvement with athletics and mountaineering within the context of my real job as an Orthopaedic Surgeon. I was born in Bowling, West Dunbartonshire, Scotland. I was my mother Kitty’s first child. Rumour has it that I was born in an Air Raid Shelter, but I think this is apocryphal. Apparently it was a ‘difficult; labour and Dr Anderson the Family Doctor from Old Kilpatrick had a hard time reviving me, which might explain my inability to break four minutes for the mile later in life. My father was in the Army at the time in the Royal Engineers Bomb Disposal Squad. I do not remember seeing much of him as a child and we did live with my grand-parents in Bowling until after the War when the family was relocated to a pre-fab in OIld Kil[atrick and later on to a proper house in Roman Crescent which was a Council House. I was not at all athletically gifted as a child nor even as a young teenager. I was what you might call “bookish”. I did very well at school and haunted the local lending libraryI did spend a lot of time in the Kilpatrick Hills wandering around, usually on my own. At high school we were required to take part in ‘track and field’ every year. I did manage to win the javelin throw on at least two occasions as I recall. Towards the end of my high school years I was introduced to the Clydesdale Harriers by a good friend, Tony Higgins, and I started to run with the ‘pack’ in Clydebank on a regular basis amd was mentored by such people as Billy Hislop, Johnny Mavlachlan, Pat Younger, Frank Kielty, Brian McAusland and, of course, Cyril O’Boyle. I managed to win the Junior Cross Country Club Championship, although I think there were only two or three other runners in the race. 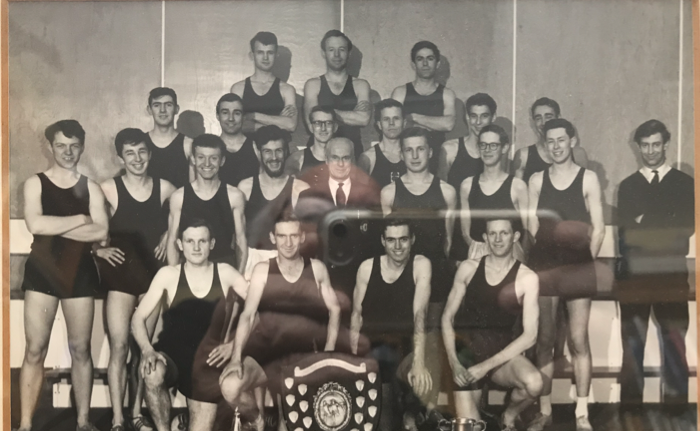 However I did persevere and when I went to Glasgow University in 1960 I went to the gym on my first day there and I was lucky enough bump into Douglas Gifford who was a very good runner at that time. He took me on my first training run in Glasgow and I quickly joined the Glasgow University Hares & Hounds. I spent the bulk of my medical school years running with them. I have to say that I did not distinguish myself to any great degree with the Hares & Hounds but I did run in the Edinburgh to Glasgow relay twice for them and I think on two occasions for Clydesdale Harriers. I was Club Secretary but I lost interest as I got into my clinical years as a medical student. I qualified in Medicine in 1966. I continued to run but mostly just for fitness purposes. I spent the next three years at Strathclyde University where I did research and obtained my Masters degree in Bio-mechanical Engineering. I was the first Medical Doctor to get a degree in Bio-Mechanical Engineering at Strathclyde. I then transferred to the University of Toronto where I did my Orthopaedic Surgical training and I qualified as an Orthopaedic Surgeon in 1974. Just prior to going to Canada I was on the Committee for the Organisation of Medical Services for the 1970 Commonwealth and Empire Games in Edinburgh. I had been selected as a team doctor for that event but unfortunately could not attend as I had just started my training programme in Toronto and sadly I missed Lachie Stewart’s great race. In 1976 I was selected to be one of the Physicians for the Montreal Olympic Games and spent most of my time looking after the equestrian athletes and especially Princess Anne who was a competitor during these Games. The 1976 Olympics occurred four years after Munich where of course the Israeli athletes were murdered by Palestinian terrorists. The organisers in Montreal were very nervous about that and especially with Princess Anne as one of the participants. The security at Bromont where the equestrian events were held was extraordinary. I located my orthopaedic surgical practice in Collingwood, Ontario, in 1974 and, as Collingwood is a centre for alpine skiing in Canada and has produced many top level skiers, I very quickly got involved in looking after ski injuries and worked with the local skiers as well as with the Provincial teams. In 1980 I went to Nepal for the first time with a group of scientists who were studying high altitude physiology on Everest. 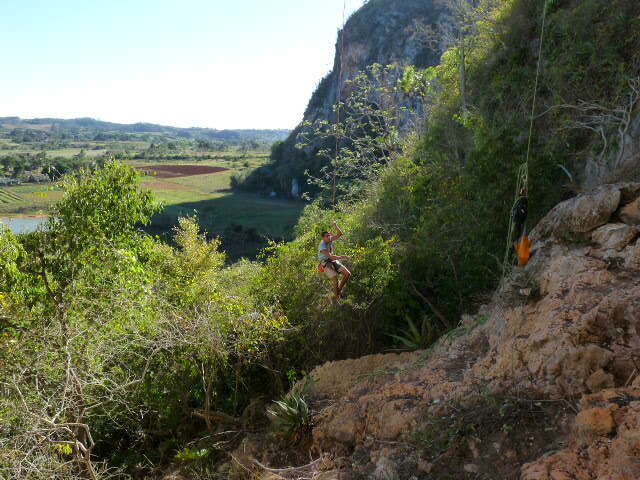 As a result of that trip I decided that I would like to explore the possibility of “climbing”. As a youngster, and also at University I made frequent trips to Glencoe and Fort William mostly just to scramble in the hills and particularly to get bevvied at the Kingshouse. I was able to meet some of the famous climbers of the day including Don Whillans, Doug Scott, Tom Patey, Dougal Haston and others. Mostly just sitting in the same room as them when everybody was having a few pints, particularly again at the Kingshouse in Glencoe. In any event, I first went to the hills for learning purposes with Mick Tighe, a very well known climbing guide. I spent some time there with Mick and his fellow guests learning the basics of mountaineering. I carried on with further instruction and guiding in Canada and I spent many weekends in the Canadian Rockies with a guide called Rob Mitchell and did climb many of the classic mountains in Canada during that period. I also went to the Alps a few times and again was able to climb some of the classic routes there. I was about forty years old when I started to climb and became increasingly obsessed with it and hired several world class guides to take me on trips to many places to climb, including China, Tibet, Nepal, Baffin Island, Europe, all over the South Western States, Canada of course and Scotland. As I got older I became interested in sailing and was able to spend several very happy trips with Sam Brook who was based out of Ardfern and was a former Royal Marine Commando who was well versed in climbing and sailing. I organised one epic trip with Sam when I brought over several elite American climbers for a sailing trip up the West Coast of Scotland with climbs of many classic routes including the Old Man of Stour, the Old Man of Hoy and many others. Prior to this I also brought several American guides over to Scotland, including Randall Grandstaff, Michael Benge, Charlie Fowler and Rob Mitchell. We climbed in Skye, including a winter traverse of the Skye Ridge and also a an ascent of the Old Man of Hoy and many other classic Scottish rock and ice climbs. In 1982 I was selected to be the Orthopaedic Surgeon for Canada in the Winter Olympic Games in Albertville, France. I also returned for two more Winter Olympic Games, including Lillehammer and Nagano as Team Physician with Speed Skating Canada. I spent almost 14 years with Speed Skating Canada as their Physician and travelled very widely during that period to Europe, Asia and North America. This included World Championships, World Cup events and other international competitions. I was responsible for developing safety issues with speed skating including the design of the padding dor the arenas, the design of cut proof clothing and helmets and other safety factors. I am no longer involved with speed skating Canada or the Olympic Association except peripherally through the UIAA, the International Mountaineering Federation and the Alpine Club of Canada, member of the Medical Commission for that organisation. I have been a member of the Med Com for about ten years now and in that capacity I travel to various countries for meetings as well as teaching. 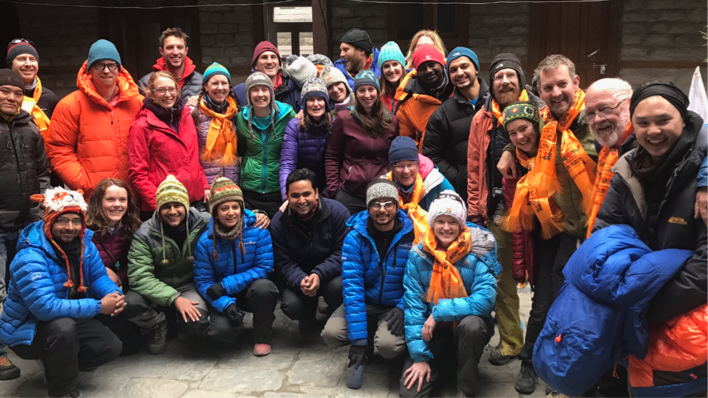 Over the last three years I have become an instructor for DIMM, which is the Diploma of Mountain Medicine in Nepal and in that capacity I travel to the mountains in Nepal and instruct on such topics as the management of fractures in the wilderness, treatment of high altitude sickness, hypothermia, avalanche safety, etc. The last trip I did there was in November, 2018. I am now, in 2018, no longer able to run or climb and I am rapidly losing my ability to hike because of a chronic bad back as a result of spending too many years standing at an operating table and also I think because I injured myself quite badly on two occasions. One when I was climbing in the Black Canyon of Gunnison in Colorado and I took a “whipper” and fell about sixty feet but bounced back at the end of the rope and .smacked’ off the wall of the canyon suffering multiple abrasions and also a fracture of my sacrum, which I did not know at the time like a ;stupid bone surgeon.’ The other about five years ago when I was on a tallship in Antarctica and I got knocked down and suffered multiple rib fractures as well as bruising of my spleen and kidney. I should note that in the last few years I have taken to going to Antarctica and the Arctic. My first trip to the Antarctic was on a sixty foot sailboat with four other people whom I did not know. This trip turned into a bit of an epic and we were lucky to escape with our lives. 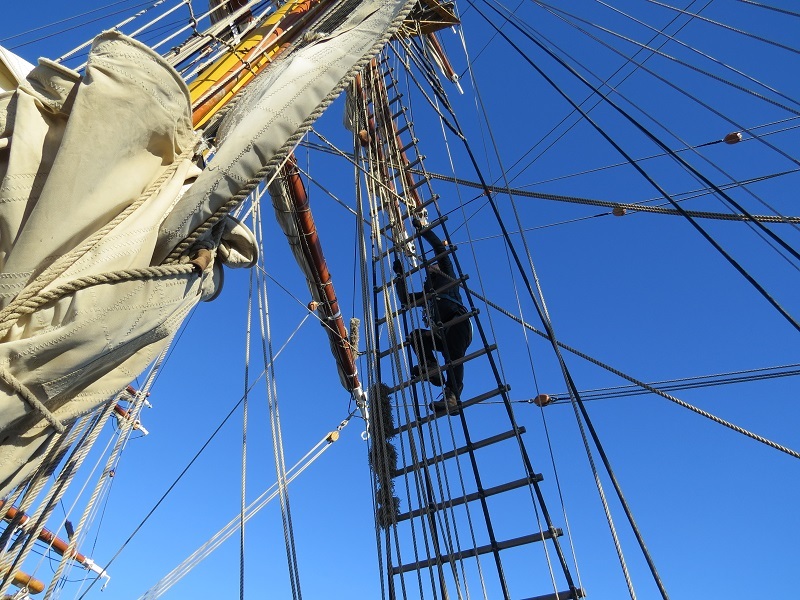 I went back down there on one other occasion on a sailboat and then I went there on a tallship. Since then I have returned but this time on a small icebreaker. The Clydesdale Harriers gave me the foundation for a life of adventure and fitness and an understanding of the value of comradeship. I think back on all those guys that I ran with with great affection. Not only were they runners, they were philosophers, they were gentlemen, they were poets and they were dreamers. They did not have sponsorship, they did not have trust funds and some of them did not even have teeth. There was no Facebook, there was no internet and it was a helluva lot of fun. It is an interesting account of a fascinating life. John was a good solid club runner who served his time with club and University before emigrating. He mentions Doug Gifford – Doug was John’s best man and recited a poem which he had written about him. Were he to do so now, the poem would be an epic, I think. Always an outdoors man, the range of John’s activities has been vast – hill walking, running, mountaineering, sailing in addition to his work as an orthopaedic surgeon. And he still found time to work with athletes in winter sports at all levels up to Olympic standard. It is fair to ask about how all the activities affected John’s work as an orthopaedic surgeon. All we can do in that regard is look at what his patients say and I append some quotes from a website rating doctors 1 – 5 on four scales. I read a dozen reviews of treatment received and all bar one gave him 5/5 for knowledge, most gave him 5’s across the board. His knowledge of his subject, his helpfulness and quality of his staff were almost uniformly given the highest marks possible, his humour was commented on several times. All in all, he is a credit to his universities and to his country.